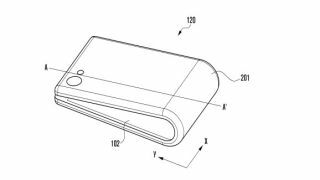 We know for certain Samsung is working on a foldable phone and aims to release it - in a likely very limited capacity - during 2018, but a new patent application looks different to a lot of other information we've seen about the Galaxy X and suggests it may actually be more akin to a flip-phone than we previously thought. Certification documents filed in Korea - and spotted/uploaded by LetsGoDigital - show the Galaxy X with a hinge design so you can bend the phone over. The documentation only shows the rear of the phone, but it suggests it'll have one long screen on the front of the device that can be folded over in a similar way to old school flip-phones. The hinge element between the two main elements of the screen could be the foldable screen tech, allowing for one long screen when the phone is laid out. It'll allow for a screen over twice as long as smartphones now without taking up as much room in your pocket. A lot of previous rumors have suggested it would have a design like a book rather than the flip-phone-esque design you can see in the gallery below. Whether this will be the final design of the Samsung Galaxy X isn't certain. We've seen lots of different designs for Samsung's foldable phone and there's no knowing for certain yet what look the company will opt for. Samsung Mobile CEO Dongjin Koh confirmed over a year ago that the Galaxy X is in development, but we expect to see a very limited release for the handset and may be just available in Korea when it finally hits the market. This is going to be a very experimental project for Samsung, so don't expect this tech to feature on the Galaxy S9 when that's released in 2018.